Two candidates have emerged from the Arizona primary election for Superintendent of Public Instruction. They are Penny Kotterman and John Huppenthal. The Superintendent of Public Instruction is the top education official in the state, and acts as the Chairman of the State Board of Education and is the head of the Department of Education. The Superintendent of Public Instruction influences policy in the legislature, is responsible for the implementation of education legislation and is in charge of the Department of Education and its interactions with school districts. Further, the Superintendent of Public Instruction commands the bully pulpit on education issues and has a great deal of influence on the direction the state takes regarding educational issues like school funding. Because of the importance of this officeholder, we have gathered information to help you make an informed decision on November 2 when you elect the next Superintendent of Public Instruction. To read why you should pay attention to the office of Superintendent of Public Instruction, click here. 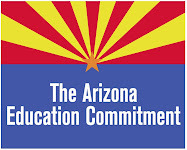 Each candidate was offered the opportunity to fill out a survey about public education that the Arizona Education Network wrote. To read their views on this 13 question survey, click the pdf links below. Still awaiting Mr. Huppenthal's survey that was emailed to him on 9/13, 9/14 and 9/18. The office of Clean Elections held a 30 minute debate between the two candidates. Hear what they have to say about how they would lead the public education system in Arizona. Are Your Candidates Education-Friendly, a guide on voting records and surveys.